When you need a hepa filtration system or UV filter system installed call us we install and supply air filtration systems. A master licensed plumber will answer any questions or concerns. We will beat any plumbing contractor or plumbing services quote. Days or night appointments. Get a free plumbing inspection with any service. We understand When you have a plumbing emergency and can be there in 30 minutes. Installation of a residential UV Air Purification System from us will improve indoor air quality (IAQ) by removing bacteria, odors, viruses and allergens from your central air system. 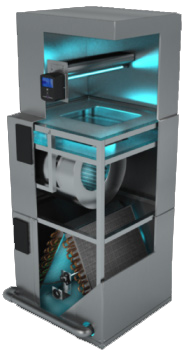 The Clear Blue units create pure air, naturally, and add an additional cleaning element to a standard filtration system. Clear Blue does this by using the natural elements of Ultra Violet (UV) light. Through innovative, safe and environmentally friendly practices, these UV air treatment systems cleanse the air without the use of harmful ozone. Each separate unit is designed to provide optimum UV treatment of up to 2,000 square feet, so you can be rest assured that you are breathing the finest quality air throughout your home. The main difference between an air filter and an air cleaner is that one collects dust, while the other sanitizes the air. Air filters will filter the air while collecting dust, such as pet dander and dead skin. Pollutants are trapped in a filter that can be regularly replaced. An air cleaner kills airborne pathogens that cause sickness and allergies. They operate silently, while eliminating odours and bacteria. Air cleaners use UV, heat, or negative ions to perform this function. How Does an Ultraviolet UV Air Purification System Work? With an Ultraviolet UV Air Purification System, you can rest easy knowing that the air you breathe is fresh, clean and pure. Eliminates 98% of airborne germs. Reduces the development and growth of microbiological organisms like bacteria, fungi, or viruses. Fights allergens, odours, and mould spores. UV light effectively kills common viruses and germs. Offers a chemical free option for sanitizing your air. Can be Installed without ductwork changes. 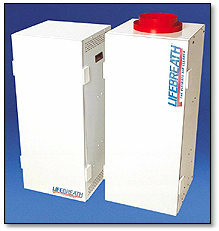 Provides savings on both energy and operation costs. Can remove particles as small as .3 microns. What type of filter is best for your home? Different types of air filters will target different forms of pollutants. In order to find one that best suits your needs, consider exactly what types of pollutants you need to remove from your home. If your main concern is allergy related problems, you will choose a different kind of filter than someone who is worried about the danger of fumes within their residence. HEPA filters are very popular. They work best on common allergens, such as animal dander and dust. They also help to eliminate unwanted odours. HEPA filters work well because they can capture even the smallest of particles. This particular filter is an excellent choice for young children, the elderly, or anyone who suffers from allergies. Ozone and ion filters work by creating charged particles that attract pollutants. They won’t eliminate them, but they do trap them. Similarly, media filters trap pollutants onto a fibre filter. These filters fit nicely into most pre-existing heating and cooling systems. They are also very energy efficient, which means a significant savings on operating costs for the homeowner. Activated carbon filters are often used in combination with other types of filters. They absorb odours and gases, while neutralizing chemicals, smoke, and fumes. When used in conjunction with HEPA filters, you will be eliminating several of the most common home pollutants.